i. MARGARET HOWARD, b. August 23, 1873, Lawrence County, Arkansas; d. August 29, 1956, Tuckerman, Arkansas. ii. LEONA HOWARD, born August 1884.
iii. JOHN W. HOWARD, b. December 10, 1888 in Mammoth Springs, Arkansas; d. January 13, 1971, Arkansas. In the 1900 Census for Lawrence County, Arkansas lists Margaret living with her Mother Susan Howard (listed as a widow), her husband Thomas Goodman, a sister Leona, a brother John W. and Margaret & Tom's three children, Henry, Zena and Taylor. Families Who Settled Here During The First 50 Years: In our first article Joseph G. Taylor named 13 families, who lived west of the town of Smithville, when the area was in Arkansas Territory. According to W.E. McLeod's history of Lawrence County, about 1840 the county, then including Sharp, opened another road east, crossing the Military road branch in Smithville. This caused the county to be settled rapidly with emigrants coming from Tennessee, Kentucky and North Carolina, and Smithville became an important trading and social center. Names of families, who lived in town in 1837, are not available. Some families, who lived in town during the first 50 years, were the SLOANS, FISHERS, BARNETTS, BABERS, SELFS, CHILDERSES, LONGLEYS, HENDERSONS, STEADMANS, GOODWINS, RANEYS, DAVISES, RUDYS, OGDEMS, WRIGHTS, HOLTS, BURNSES, THORNSBURGS, THORGMORTON and TOWNSENDS. Some of these were descendents of the pioneer families. Living in nearby country and many not named by Mr. McLeod or Mr. Taylor were the JONESES, NEWTONS, MILLERS, WHITES, FOLEYS, TODDS, TOWNSENDS, COFFMANS, PERKINSES, HOWARDS, BEYERS, and WHITLOWS. Also FORTENBERRYS, PEEBLES, KENDALLSs, BILBREYS, FIELDS, TURNBOWS, BOBOS, GOADS, JUSTUSES, GIBBENS, BRATCHERS, and ALENXANDERS. On, or nearby on the new road east, were the DUNGANS, BAKERS, MOORES, JUDKINSES, BORAHS, WASSONS, LANES, McLEODS, McGEES, LEES, SMITHS, ROWSEYS and WAYLANDSs. Two of the men swam the Mississippi to get here, a family came in a covered wagon pulled by an ox and a horse, and others came in covered ox wagons. Sixty-five family names have been listed and fortyfive of them are known to have descendents living in the Lawrence County at this time. (1984). Some businesses established during this time were Bobo and Sloan, Thorgmorten, Sloan and Marshall, Eli Thornburg, J.H. Townsend, Printers and Book Seller, Sloan and Henderson, Brady and Son, and Rudy Drug and Mercantile. One early merchant was "a respected slave, `Uncle George', owned by Peter Holderman. He ran a little bakery in a log house in town. These families organized three churches in a log school house and two had good frame buildings erected. Subscription schools in the log school house progressed to a large one room frame building built by Jasper N. Hillhouse in 1872 on land donated by W.C. Sloan. He taught subscription schools until 1874, when the state constitution provided for schools to be supported by state taxes and local district taxes. i. HENRY GOODMAN, b. December 1892.
ii. ZENA GOODMAN, b. October 1895.
iii. JONATHAN TAYLOR GOODMAN, b. January 13, 1898; d. May 18, 1959, Jackson County, Arkansas. iv. CURTIS GOODMAN, b. Abt. 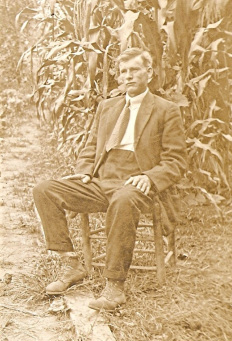 1900; m. LEE MORE, September 26, 1922, Jackson County, Arkansas. Not much known about Curtis other than that he died young. v. LILLIE MAUDIE GOODMAN, b. August 02, 1904, Arkansas; d. August 1976, Marion, Grant County, Indiana. Notes for JOE "DOCK" LAIRD: Dock Laird had a brother who commited suicide by slitting his own throat. JOHN WESLEY HOWARD (TAYLOR) was born December 10, 1888 in Mammoth Springs, Arkansas, and died January 13, 1971 in Arkansas. He married ANNIE CORBITT July 04, 1915 in Jackson County, Arkansas. She was born March 31, 1892, and died July 14, 1975 in Arkansas. JOHN W. HOWARD and ANNIE CORBITT: Burial: Ballews Chapel Cemetery, Grubbs, Arkansas. World War I registration card stated that John was living in Grubbs with his wife and child on June 5, 1917 (date he registered). His WW II registration card showed that he was living at R.F.D. 2, Newport, Arkansas, farming for self in 1942.
ii. PAULINE B. HOWARD, born 1920 in Arkansas. Married ELWOOD VINES. JONATHAN TAYLOR GOODMAN (MARGARET HOWARD, TAYLOR)was born January 13, 1898, and died May 18, 1959 in Jackson County, Arkansas. He married POLLY ANN DEVORE January 07, 1920 in Jackson County, Arkansas, daughter of HENRY DEVORE and PATSY MCCOY. She was born October 12, 1891 in Grubbs, Jackson County, Arkansas, and died May 14, 1963 in Jackson County, Arkansas. i. HENRY ORDEN GOODMAN, b. November 27, 1921, Jackson County, Arkansas; d. May 05, 1999, Marion, Indiana; m. WANDA PEARL "JIGS" BATSON; b. December 26, 1926, Weiner, Arkansas; d. October 14, 1989, Marion, Indiana. ii. LEWIS CHARLES "LC" GOODMAN, b. April 24, 1924; m. (1) MARY CARRILLO; m. (2) MILDRENE HENSLEY, September 28, 1946, Jackson County, Arkansas. iii. CURTIS GOODMAN, b. March 23, 1928; d. April 12, 1928.
iv. LUTHER HAROLD GOODMAN, b. February 19, 1929, Jackson County, Arkansas; m. (1) MARY JOAN GIFFORD, July 25, 1955, Jackson County, Arkansas; b. September 25, 1937, Leachville, Craighead County, Arkansas; m. (2) NORMA JEAN CARTER, August 19, 1972, Jackson County, Arkansas. Divorced in 2009.
v. MARGARET IMANEAL GOODMAN, b. April 23, 1931, Jackson County, Arkansas; d. November 14, 1998, Swayzee, Indiana; m. NATHAN E. LASSITER, February 08, 1947, Jackson County, Arkansas; b. January 13, 1927, Tuckerman, Arkansas; d. July 03, 1995, Marion, Indiana. vi. RAMON GOODMAN, b. October 26, 1933; d. August 06, 1934. MAUDIE LILLIE GOODMAN (MARGARET HOWARD, TAYLOR) was born August 02, 1904 in Arkansas, and died August 1976 in Marion, Grant County, Indiana. She married TOM B. BOAZ March 12, 1922 in Jackson County, Arkansas, son of CLINTON BOAZ and MARY MCNEELY. He was born 1900 in Oklahoma, and died 1960 in Jackson County, Arkansas. i. CLINTON E. BOAZ, b. April 09, 1941, Tuckerman, Arkansas; d. August 28, 2000, Marion, Indiana; m. HELEN PICKERING. ii. LULA BOAZ, m. ROBERT BAKER. v. MARY BOAZ, m. FREEMAN FORD; b. Abt. 1917. PAULINE B. HOWARD (JOHN, TAYLOR) was born 1920 in Arkansas and married ELWOOD VINES March 6, 1943. He was born December 14, 1919 in Melbourne. Son of JOHN THOMAS VINES and RUTH GILLIHAN. Appearing in the NEWPORT DAILY INDEPENDENT: Mr. Elwood S. Vines, 90, of Grubbs died Wednesday, July 21, 2010 at Jonesboro. He was born Dec. 14, 1919 in Melbourne, the son of John Thomas and Ruth (Gillihan) Vines. He married Miss Pauline Howard on March 6, 1943. Mr. Vines was preceded in death by his wife, Pauline Howard Vines; one daughter, Phyllis Dian Vines; and six brothers, Lawrence, Ralph, Theodore, Elton, Cecil, and Dearl. He is survived by two sons, Alvin Glen Vines and wife, Sandra, of Grubbs and Dr. Troy Alan Vines and wife, Sharon, of Jonesboro; one sister, Etna Ahart of North Little Rock; five grandchildren; and six great-grandchildren. Funeral services were held at 11 a.m. Saturday, July 24, 2010 at Ballew’s Chapel Free Will Baptist Church with Bro. David Winfrey and Bro. Hoover Lewis officiating. Interment followed in Ballew’s Chapel Cemetery. Visitation was Friday, July 23, 2010 from 6-9 p.m. at Jackson’s Funeral Home.